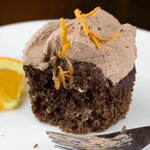 Light, spongey chocolate cupcakes are flavoured with orange zest and topped with fluffy chocolate whipped cream. These cupcakes are like little chocolate clouds! The cake is light and the cream is fluffy and together they make a delicious and decadent treat. In a small bowl, stir the cocoa into the hot water until it dissolves, set aside. Sift the flour, baking powder, baking soda and salt together into a medium bowl. Grate the zest from the orange into the bowl and stir to combine. In a large bowl, whisk together the eggs and applesauce. Whisk in the buttermilk, orange juice and vanilla, then the the dissolved cocoa. Whisk in the melted butter and then the flour mixture. Spoon the batter into the muffin cups, filling about 2/3 full. Bake the cupcakes until puffed and a toothpick inserted into the centre of a cupcake comes out clean, about 15 - 20 minutes. Let cool completely on wire rack. Frost cupcakes with sugar free chocolate whipped cream frosting. In a medium bowl, stir the cocoa powder with 1/4 cup whipping cream until blended. Add the rest of the whipping cream and the vanilla, and using an electric mixer, beat on low until soft peaks form. Spread onto cupcakes with a palette knife, or spoon frosting into a medium sized freezer bag, cut off one of the bottom corners of the bag, seal the top and pipe onto the top of the cupcakes. Before you zest the orange, you may want to use a citrus zester to remove some long strands of zest to use as garnish on the finished cupcakes. Use the citrus zester for the decorative strands, and a microplane zester to remove the zest that is to go into the batter. For a sweeter cupcake, replace the 1/2 cup of unsweetened applesauce in the Mildly Sweet recipe above with 1/4 cup sugar. Whisk the eggs with the sugar in step 4. Omit the unsweetened applesauce. Adapted from: Chocolate-Orange Cupcakes from The Williams-Sonoma Baking Book: Essential Recipes for Today's Home Baker .